SenseCy’s teams monitor underground and password-protected forums and communities in many languages – Russian, Arabic, Persian, Chinese, Portuguese, English, and more. By gaining access to the Deep Web and Darknet, we identify suspicious activity and new hacker tools and enable our clients to mitigate or eliminate cyber threats. Hacker communities on social networks continue to evolve. More and more communities are creating Twitter accounts as well as pages and groups in popular social networks such as Facebook and VKontakte (a Russian social network) to share information, tools, and experience. In the past, hackers came together on social networks to hold operational discussions, share targets, and join forces for DDoS attacks, but less to upload or download hacking tools. Since this is changing, we are now monitoring hacking tools offered for download on Twitter, Facebook, and VKontakte. Open public groups and accounts that make common, well-known tools available. Closed, secret groups sharing rare or sector-related tools or programs in a specific language. Groups sharing or even selling self-developed tools. A prominent example is the self-developed DDoS tool created by hacker group AnonGhost for the #OpIsrael cyber campaign, which is expected to take place on April 7, 2015. This tool uses three flooding methods, TCP, UDP, and HTTP and can operate through a proxy if needed. 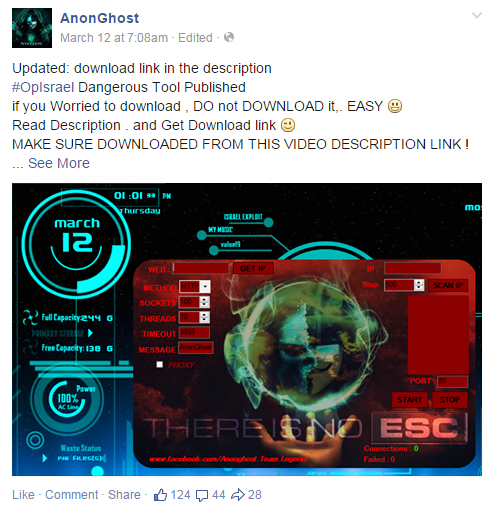 AnonGhost posted its new tool on its official Facebook page with a link to a tutorial on YouTube, and soon it was widely distributed among hacktivists through social media. We regularly monitor trends and developments in social networks, since they are becoming the preferred platform for groups of hackers to share and improve attack tools. SenseCy also takes part in these communities, which gives us the edge in preventing attacks in real time. We continue to track new trends and developments to detect cyber threats for our clients. Social networks are well-known tools used by activists to mobilize the masses. As witnessed during the Arab Spring and in recent incidents in Hong Kong, government opposition groups can organize dissatisfied citizens by means of a massive campaign. More closed countries, such as North Korea or China try to limit access by their citizens to international social networks such as Twitter or Facebook. We have noticed an increasing tendency toward anti-government campaigns in Asian countries and the cyber arena plays an important role in this process. We have identified this kind of activity in China, Malaysia, Taiwan, Japan and North Korea. Local cyber hacktivist groups are calling for people to unite against infringements on freedom by violating privacy rights. Hacktivists are organizing anti-government groups and events on popular social media platforms and are posting tutorials on how to circumvent the blocking of certain websites and forums in countries where such Internet activity is forbidden. Furthermore, the groups are posting provocative materials and anti-government appeals in local Asian languages, alongside to English. Thus, we can see an attempt to recruit support from non-state activists for a national struggle. These groups are eager to reach a large number of supporters, and not only for political and psychological purposes. Together with publishing tutorials for “safe browsing” in the Internet for large masses of people the groups translate popular cyber tools for mass attacks and they disseminate instructional manuals translated into local languages on how to use these tools. One example of exactly such an organization is Anonymous Japan – an anti-government hacking group. The group develops and uses DDoS tools and is also involved in spam activity. Furthermore, members of the group develop their own tools and publish them on Facebook for wider audiences. Amongst the large-scale campaigns launched by this organization, you can find #OpLeakageJp – an operation tracking radiation pollution in Japan. In addition to internal struggles, hacktivist groups are operating against targets in the area. One such example is operations by hacktivism groups personifying themselves with North Korean insignia and targeting sources in South Korea. 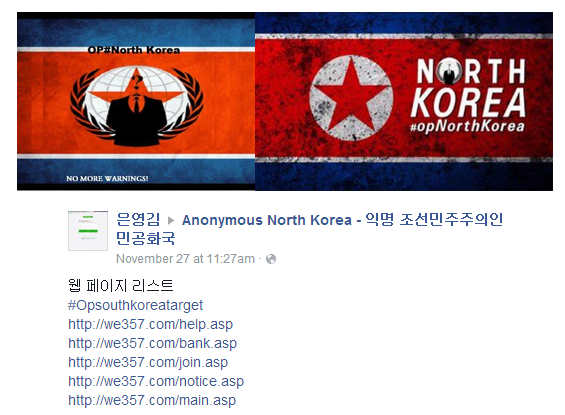 Examples of such cyber campaigns are #Opsouthkoreatarget and #OpNorthKorea. In China, we found an example of the #OpChinaCW campaign. A cyber campaign hosted by Anonymous was launched on November 2, 2014 against Chinese government servers and websites. The campaign was organized on a Facebook event page and was further spread on Twitter. Hacktivists have also published cyber tools for this campaign. 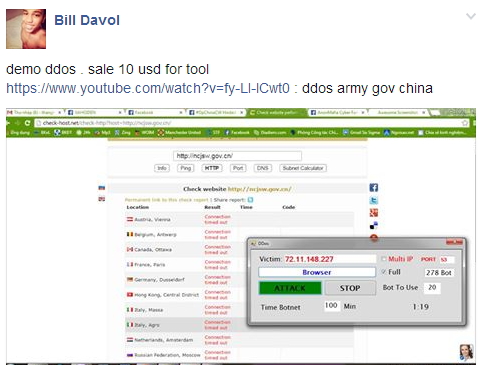 See below an example of a DDoS tool sold on Facebook for only US$10. As previously mentioned, cyber activity in the Asia region is directed not only against enemy states, but also against the “internal enemy” – the government. Hacktivism groups not only organize such campaigns on underground platforms, but they also make wide use of open popular social networks to recruit supporters. Moreover, they also develop their own cyber tools. New Smartphone technologies have made our lives easier. At the touch of a button, you can call a cab, pay bills, connect with your friends and even reach your personal trainer. On the other hand, the world of hacking and cracking now also has a lot of useful tools to hack your system and steal your data, using a smartphone. We have recently seen the development and publishing of hack applications for smartphones on underground forums. The wide range of such tools means that anybody can find a suitable tool for dubious purposes. The items available include a variety of DDoS tools, wireless crackers, sniffers, network spoofers and more. 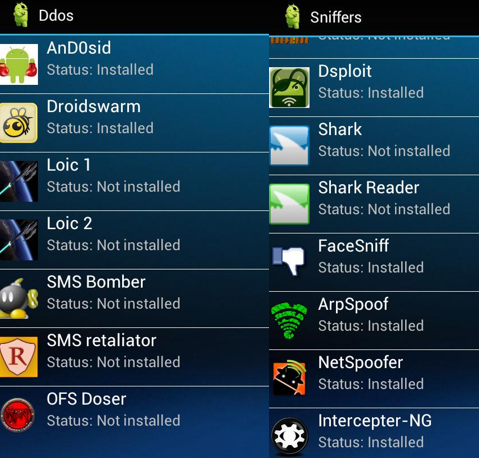 Most tools are only available for Android smartphones, and many require root permissions. The most popular tool for cookie theft is DroidSheep. With the help of this tool, an attacker can collect all browsing data, including logins, passwords and more, merely by using the same Wi-Fi network as the victim. Moreover, the attacker can connect to the victim’s password-protected Wi-Fi network. There are several Wi-Fi cracking tools, for example, WIBR+ uses uploaded password databases to identify passwords common to the victim’s network. The users can also upload and update these databases. Another tool – Wi-Fi Kill – is capable of shutting down any other device connected to the same network and can intercept pictures and webpages recently visited by users of this network. 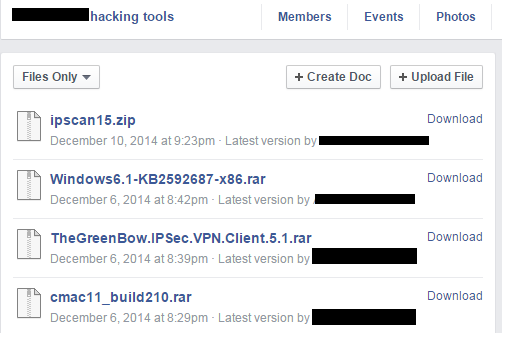 More and more tools now include more than one hacking capability. The DSploit tool features such functions as password sniffers, cookie sniffers, browsing history sniffers, and webpage redirecting. Another program, Bugtroid, contains cracking and protection applications. 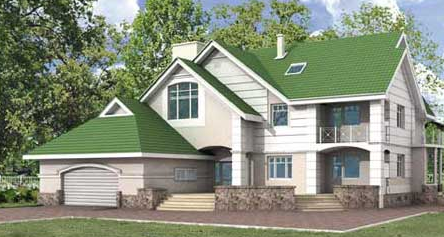 The owner can choose the most suitable program from a list and install it in one click. The tool offers a variety of tools to suit almost every cracking purpose. For iOS systems, there is a limited number of hacking tools, mostly in the realm of game cracking. Examples of such tools are GameGem and iGameGuardian. These tools break games for the purpose of stealing monetary units. The most common tool for iOS is Metasploit, which contains a number of useful applications for different fields. The tools presented above are not new, but they represent the main capabilities in the field. We are seeing a growing tendency to use portable devices, such as smartphones and tablets, to conduct attacks in public places. Mobile devices and public Wi-Fi networks tend to be less protected and more vulnerable. With the help of collected data by mobile device, the attackers can perform more complex attacks via PC. As long as there is no protection awareness regarding mobile devices, we expected a continued increase in the number of smartphone-based attacks. WhatsApp Messenger is an instant messaging subscription service. In addition to text messaging, users can send each other images, video and audio media messages, as well as location data. As of September 2014, WhatsApp is the most popular global messaging app, with 600 million users. Aside from regular users, more underground communities like to use this application. WhatsApp activity is more complicated to monitor by a third party than regular phone messages and some online services. WhatsApp has proven to be a fast, reliable and inexpensive service for sharing various kinds of information. The cyber underground is also seeking new platforms for chatting and sharing information. Lately, we have identified an increasing number of hacker-affiliated groups using WhatsApp services. These groups offer members chat services, hacking tips, cyberattack coordination and more. Members from numerous countries, including Bangladesh, Pakistan, Indonesia and others, expose their phone numbers to connect to such groups. There are several manuals describing how to access other WhatsApp accounts. 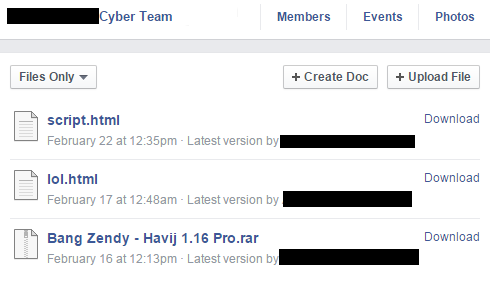 One post shared two different methodologies to do just that: spoofing with the help of Mac number, and using spy software. This post received over 738,000 views over a two-week period. In addition to spy methodology, you can find various tools, such as WhatsApp Hack Spy Tool, WhatsAppSniffer, WhatsApp Xtract, WhatsApp Conversation SPY Hack Tool and more. You can also use third party spyware. These tools can be used for Android, iPhone and BlackBerry devices. Tools provide such features as tracking all voice notes, viewing all user chat logs, updating profile pictures, sending messages to contacts, changing profile status and more, depending on the tool. The dissemination of such tools is becoming common also on social networks, such as Facebook, Twitter and LinkedIn. 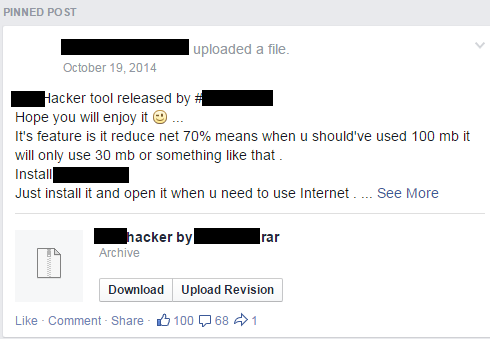 A Facebook page titled “WhatsApp Hack Spy Tool” has 390 members, mostly from India, Italy, France and the U.S. This page also has a related Twitter account with more than 3,500 followers. 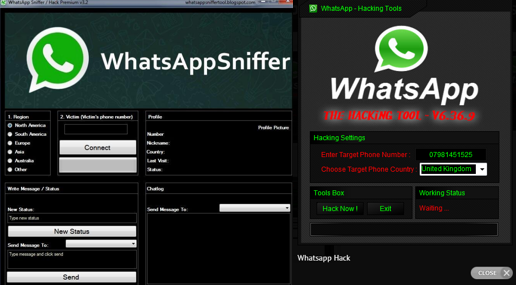 Another Facebook page titled “WhatsApp Hack Sniffer Spy Tool” has over 13,500 members, mostly from Turkey and India. Furthermore, advertisement for the tool can also be found on LinkedIn. 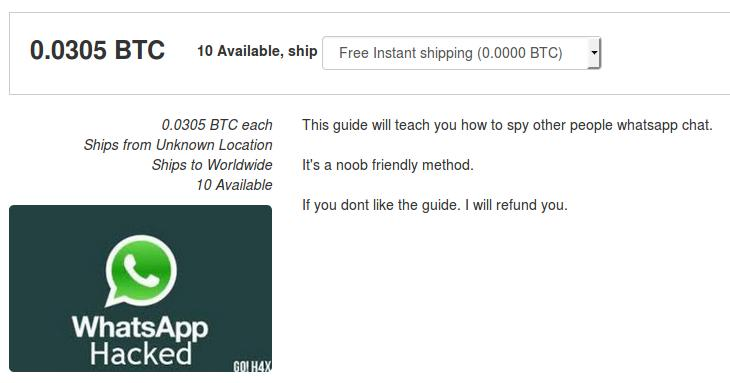 In addition to the free tools, you can purchase more unique software, such as a tool for hacking WhatsApp, only ten copies of which were released for sale on the DarkNet for 0.0305 BTC. The use of WhatsApp by hacktivist communities, together with the development of hacking tools and methodologies, has opened up a new platform for the cyber community. These two directions provide a fast, inexpensive and more secure way for hacktivists to interact, coordinate operations, and exchange information and mobile hacking techniques and data vulnerabilities. Want to Kickstart a Hacktivist Campaign – Click Here! We are currently witnessing a new phenomenon of popular uprising against governments in some post-Soviet Union countries. More and more citizens are forming active groups to protest against government corruption, the licentiousness of officials and government policy on various issues. Alongside these opposition groups in the physical world, anti-government campaigns and the struggle for human rights and democracy, we have identified a similar struggle in the realm of cyberspace. The Anonymous Russia group regularly publishes leaked data from the hacked databases of buyers of elite watches and luxury housing in various Russian cities. These consumers include numerous state officials. The group additionally hacks the email conversations of Russian officials, thus stealing other sensitive information regarding government policy and actions. This information typically includes personal information regarding the victim – passport numbers, telephone numbers, addresses, etc. On the group’s official website, you can ask for help from Anonymous Russia, report any illegal activities by officials in your region, offer your help, or support the project. The team accepts financial support for the project and gladly converts any monetary contributions to Yandex, WMR or WMZ wallets. Many activists groups fundraise for “justified activity.” Such actions encompass a variety of fields – hacktivist, jihadi and other groups united by certain causes. These groups are usually totally dependent on their supporters for funds. A new trend dubbed crowdfunding in the field of fundraising has become very popular among NGO organizations, artists and other social projects. Crowdfunding is a new method of commerce and patronage. This is not an investment or a loan of any kind and the fundraisers usually state the purpose of the project. People who are interested in supporting such a project are welcome to donate whatever sum they wish. We have not seen the Crowdfunding fundraising method before now in cyberspace. 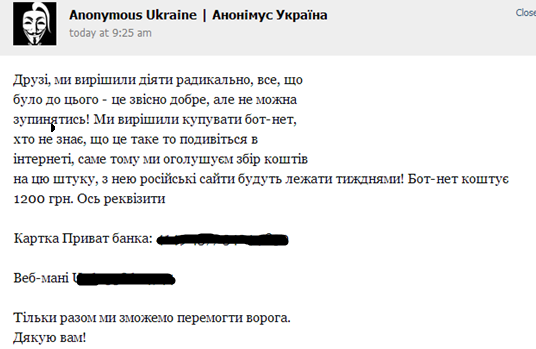 Recently, the Anonymous Ukraine group posted a request for help on the popular Russian-language social network VKontakte. The group acts against the Russian government, the Ukrainian opposition and organizations and media that support pro-Russian policy in Ukraine. Their main activity vector is DDoS attacks on media websites. Alongside their successes, there are many failed attempts. Notwithstanding, the group appealed for financial help from supporters to purchase a botnet that purportedly increases the effectiveness of attacks. 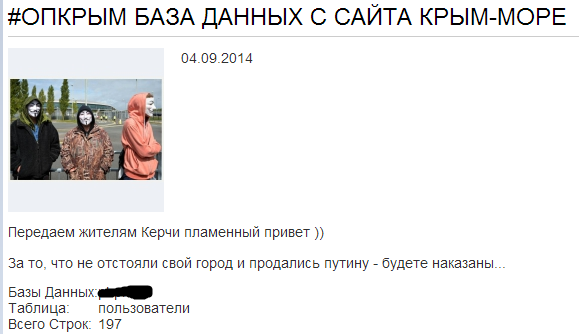 For this purpose, Anonymous Ukraine used Crowdfunding to raise 1200 Ukrainian Hryvnia (UAH). Leave a comment Want to Kickstart a Hacktivist Campaign – Click Here!